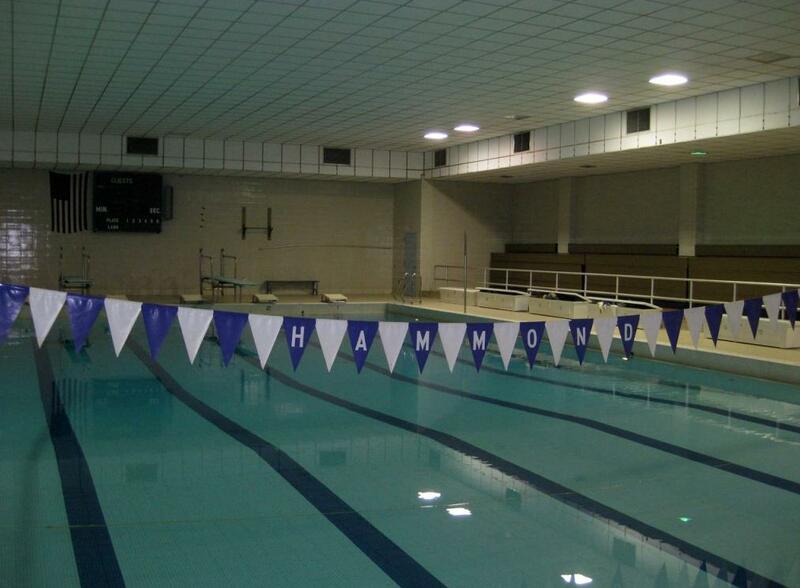 Construction workers building the Hammond High School complex, pause a minute to take this memorable picture. With still a great deal of work to do, Indiana limestone blocks await their final move into the structure on Calumet Avenue in Hammond. 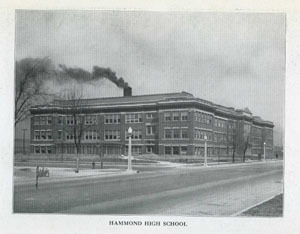 The present Hammond High School building was constructed in the 1914 and was known as the Industrial High School, on Calumet Avenue. 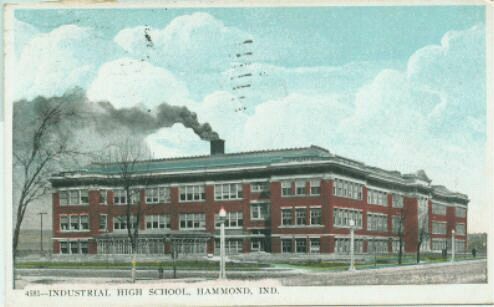 It was built west of Maywood Park and now sits across the street from Hammond's City Hall. 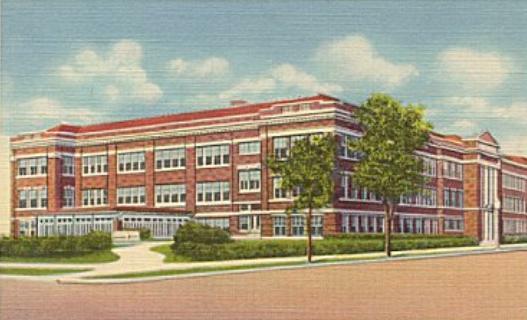 The west side of HHS is viewed as the new auditorium is added into the original design. "There are compensations in all things -- even in going to school and having the walls built around you while you wait. There have been -- to be sure -- trifling inconveniences. Sometimes the din of hammers has drowned out the din of the classroom; sometimes the drilling in the floor of 222 has sent teachers and pupils below into a state bordering on hydrophobic hysteria; sometimes the all-permeating fragrance of "benzined" floors has been almost more than could be borne. We have eaten our lunches seated in the hall next to cavernous holes in the wall, whence chill breezes swept in, and cooled our soup -- and us. And everywhere there has been the dust, -- we have breathed it, tracked it, seen it, smelled it. It has been all pervasive. But these are pains of the past, and the building, of which we are now so proud, is well worth all such minor annoyances." 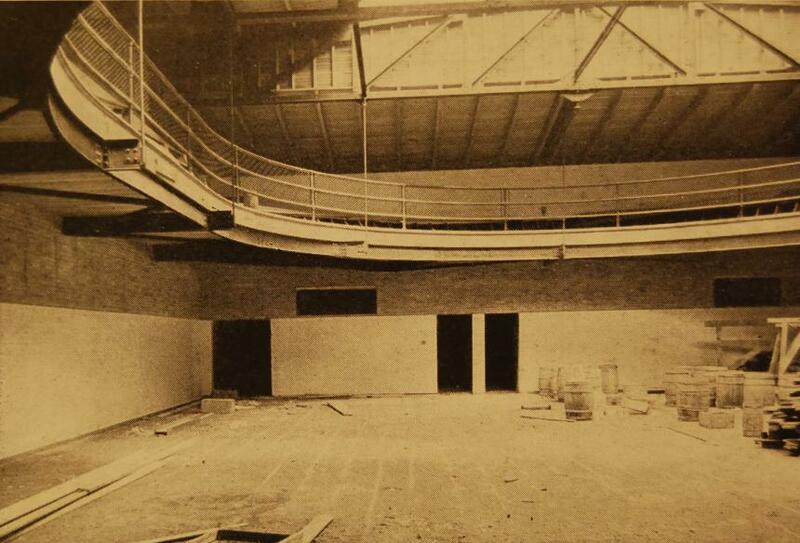 This interior picture, taken in 1921, shows the Hammond High boys gym under construction. The running track was eventually filled with lockers for football, baseball, and track athletes and had a short life as a running track. The main floor provided room for basketball practice and other indoor gym activity. Then and Now... 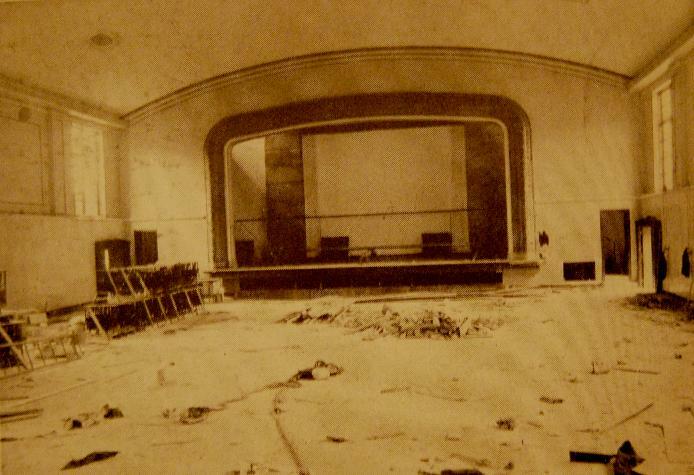 The HHS Auditorium under construction in 1921 and (right) as it appears now. 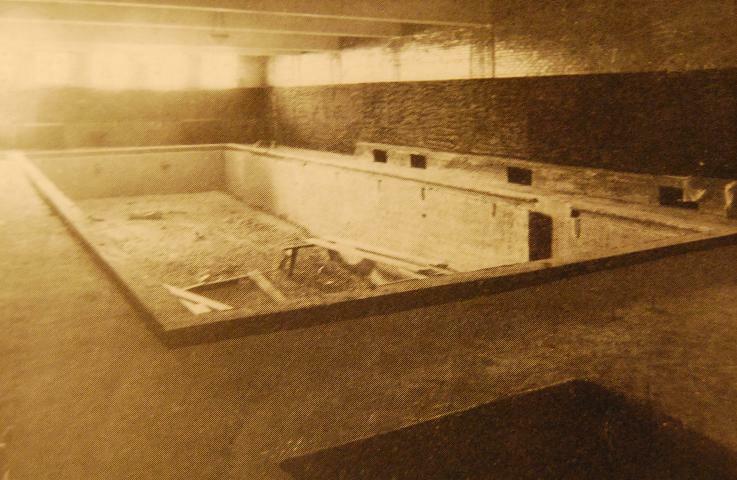 Then and Now: HHS Pool construction in 1921 and new pool constructed after the fire of 1967. 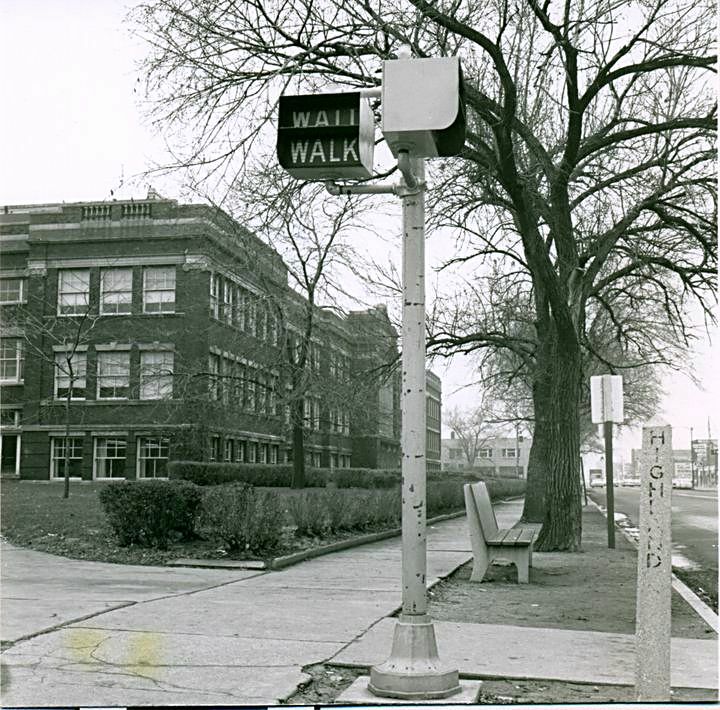 Looking north on Calumet Avenue & Highland Street. 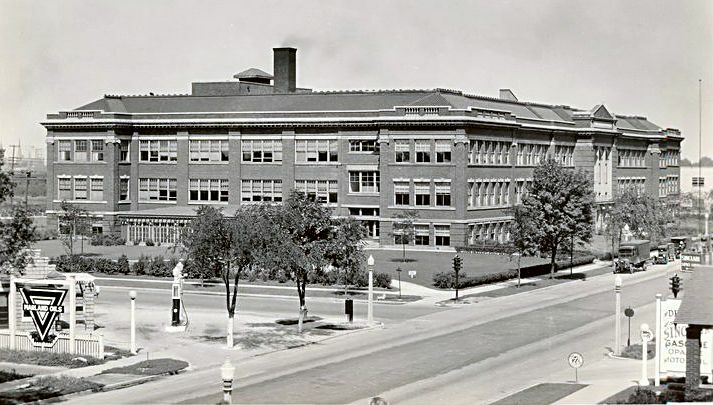 A 1933 view of the cafeteria addition and the sidewalk that most of us used to enter the building when we got off the bus on Highland Street. 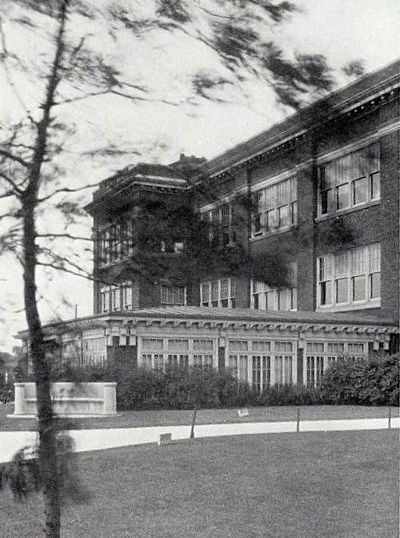 This 1923 photo of HHS appeared in the '23 issue of The Dunes. It was taken by O.W. Bodie and published in black and white. 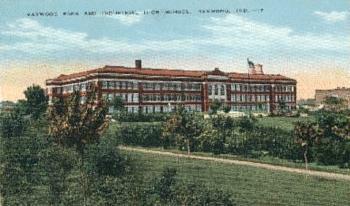 When the 1923 photo appeared on this postcard, artists colored in image and removed Bodie's logo in the lower left of the original. Sky looks better, too! 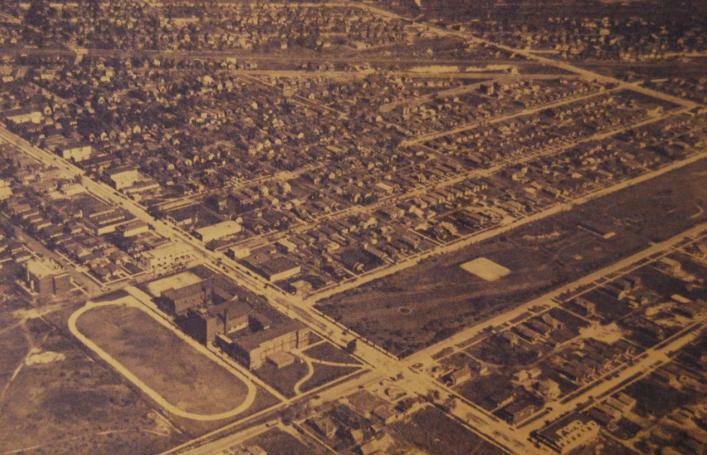 To the right, an aerial view of Hammond High School (to the right of the oval track) across Calumet Avenue to Maywood Park, before the City built City Hall. 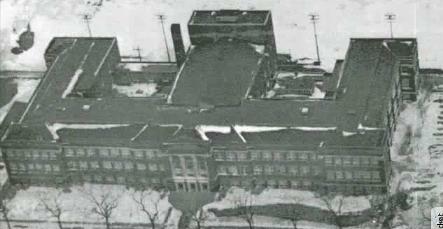 This is the more classic photo used to represent Hammond High School during the 1950s and 1960s. Most HHS grads can still pick out sections of windows and remember which classes were held in that particular room. 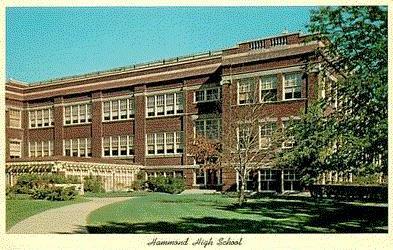 This is Hammond High School that we knew in 1959. We came from all neighborhoods in Hammond and Munster, a rich mixture of social and ethnic backgrounds that prepared us for dealing with a complex world.